An interesting discussion unfolded into the Equity Unbound hashtag the last few days as some of the organizers — who are university professors — launched a Twitter scavenger hunt, where people tweet mystery images and others tweet guesses as to what the image is. 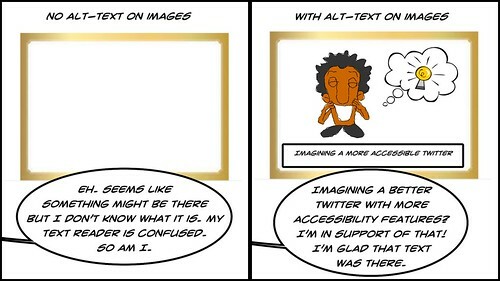 The issue of accessibility to images and information for disabled participants, particularly those who use screen readers, sparked a discussion about the use of “alt-text” on images. If you don’t know what that is, alt-text is an option that allows you to layer some informational text along with an image, so that a screen reader for a blind participant, for example, can understand that an image has been shown and get some understanding of what the image is. (This is not to say screen readers are perfect, either). On Twitter, you have to go into your profile on the web version and find the setting, and turn it on. It’s way at the bottom of the options. Once on, every image you post will give you a prompt on adding text to the image. But, the default for the setting is “off,” which seems rather strange. Maybe there is a technical reason. But I doubt it. (Mastodon, for example, has the default “on” for all users.) It’s also odd that the setting on Twitter for this is at the very bottom of the options, as if were a throw-away issue. 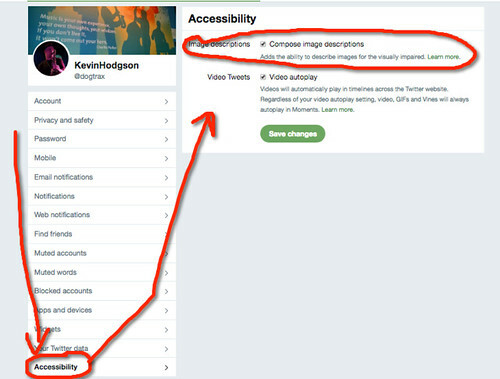 I tweeted out an idea off the top of my head yesterday morning as I was thinking about accessibility — what if the Equity Unbound community wrote a crowd-sourced letter to Twitter, asking for it to make the alt-text option to be default as “on” as a way to make the platform for more accessible. After a day of teaching in the classroom, I found that a bunch of folks had taken up the idea, and a letter was already underway. Our friend, Greg, has been helpful in starting to share some online resources about this topic, and one of the links breaks down the types of images that might need alt-text for screen readers (such as informational images, photos with text in it, maps, etc.) and those that may not (decorative images). I also found a neat flowchart for making a decision about alt-text. There are also tips and tricks, and Alan even shared out a link about his suggestions for how one might write alt-text in a way to adds to the conversations. Will Twitter listen to such a letter? Who knows. At times, it has seemed to ignore complaints and suggestions from its users. At other times, it seems like it has listened and made changes. If nothing else, it has all of us in theEquity Unbound network thinking about accessibility issues with digital platforms, and how to make the barriers of entry as low as possible for as many voices as possible. Last night, Bethany hosted an amazing Twitter Chat for WriteOut, in which participants explored a sense of place, the value of maps as a literacy tools, whose stories are not being told and more. This curation does not collect every tweet (there were more than 250 responses to just six questions, if my count is right), but I tried to gather as many as I could that kept the discussion flow going. I apologize if something you tweeted that seemed important to you got left out of the mix. From a personal stance, I found the thread about a common appreciation for maps to uncover stories to be interesting, and it makes me think about explicit teaching of not just reading maps (valuable) but also the making of maps to tell stories. And there is the notion of what is left off the map, of course, and whose hand is behind the construction of a map (and what they want to highlight and what they want to leave off). I also think the final question — about whose stories remain hidden in public spaces like National Parks and other historic sites — is critical for teachers to help students grapple with. Using primary sources and other historic materials, we can find those stories, and bring them to the surface in interesting ways. Park spaces are part of a nation’s memory, and we can’t forget the stories of those who have been lost or purposefully marginalized. The curated chat is here, via Wakelet. It started with a poem about not having a poem to write about. Or rather, a morning where Bud Hunt didn’t post an image to inspire poetry, as he has been doing all month. I am a creature of writing habit, so when the prompt wasn’t there, I still had to write a poem, and then shared it with Bud on Twitter. From there, Bud wrote a poetic response, on Twitter, and I heard an echo of a famous poem in his opening lines, so I tweeted back with my own poem. Dave Cormier jumped in and before I knew it, we were doing some poetry ping pong. You can nearly hear the works of Poe, Whitman, Angelou, Williams, Wordsworth, Dickens, and others, if you read carefully enough in our Twitter poems. Not that we were being true to the poems, only that we were building off the familiar. I gathered them up into a Twitter Moment (my first stab at Twitter’s curation tool). Take a look. I think I got them all. For all the talk we have of the worries and dangers about social media, a small experience like this — a poetry riff that emerges only from creativity and connections — is a gentle reminder of the possibilities that come when people and ideas flow together, with humor and humanity. Last month’s theme in CLMOOC to “audit” our digital lives and activities has been quite valuable. I’ve done some weeding of followers/following in Twitter and beyond, and cut back on my email notifications designed to draw me into social media spaces. I’ve spent time thinking about the role of social media, and my use of it. One observation that I made about myself is this: On Twitter, my identity is mostly as a teacher, talking learning and connecting with other teachers. But on Mastodon (a federated social network free of corporate influence), I feel like I am a writer. Of course, there is overlap — I sometimes write about teaching in Mastodon and I sometimes make and share other kinds of work than educational pieces on Twitter — but my digital identity has sort of solidified in those spaces on one spectrum or the other (at least, in my head). I noticed this landscape as I was culling through and removing hundreds of followers and those I follow on Twitter (literally, I think I cut back on nearly 1000 people, and counting, as I continue to prune), and thinking about why I would keep whom I kept. Mostly, those who remained were connected to education. Which makes sense. I write a lot and share a lot about being a teacher. I ask for resources from other teachers. My hashtags that I follow in Tweetdeck are nearly all related to learning and teaching. In Mastodon, that is not the case. 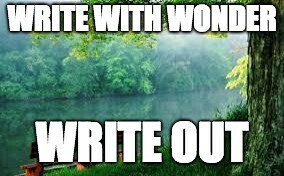 There, I write and share spaces with other writers. Some are fellow teachers (with overlaps in Twitter, even) but even they are less likely to go on about teaching. We write about other things there. I’ve taken to writing in a “small stories” section of Mastodon with regularity. I also share small poems and pull out small quotes from books I am reading. (Small as a form of writing is a common theme for me in Mastodon). Now, some of this observation of Twitter-teacher/Mastodon-writer is due to the folks who inhabit the spaces, I think. I have long been connected to other teachers, mostly through National Writing Project, since my first day of Twitter, thanks to the guidance of my friend, Bud Hunt. My entry point was a network of teachers, with mostly a United States connection. In Mastodon, what I see are all sorts of other people in other professions, from other parts of the world. There are computer programmers, social activists, social service workers, artists and animators, professional clowns and more. I’ve tapped into something grander than Twitter, and it feels like a more nurturing space for writing. Maybe that’s because Mastodon is still fairly small in size and reach. It’s also due to the underlying philosophical concept of Mastodon — that the users are in control of the network, not the network itself (for, there is no main organization overseeing it all — it is spread out across many servers in a federated space). And here? This blog? 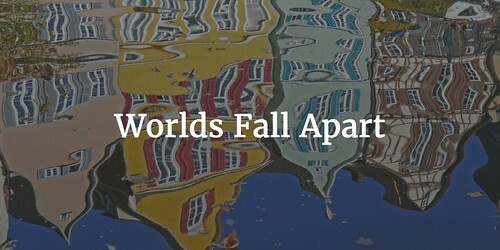 I think this blog is the space is where those two worlds — teacher and writer — often intersect, collide and sometimes even crash. 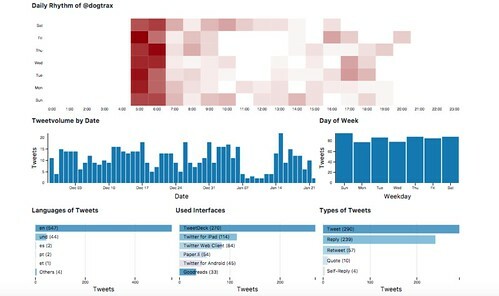 #NetNarr Twitter Analysis: Where, When, How and …. Why? I followed a link to a Twitter Analysis tool via Networked Narratives as part of an examination of our digital lives in the spheres of social media. This all connects nicely to the Digital Audit of this month’s CLMOOC. Convergence is nice. The Twitter Analysis tool provides a useful visual glimpse of a single user’s interactions in Twitter. Mine is no surprise. I do a lot of sharing and writing and working in the early morning hours (like, eh, right now), and I will often use various devices and platforms throughout the day. You can see the time period earlier this month where I took a step back from Twitter — and I wrote about my weeding out of Twitter followers and folks I have been following — and then NetNarr brought me right back again. 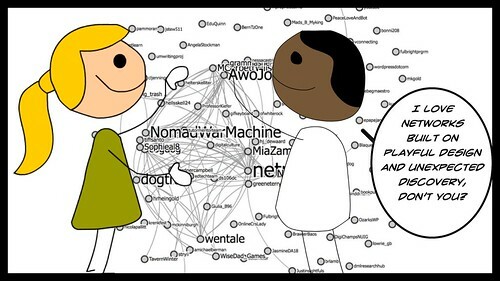 The NetNarr folks — Alan Levine and Mia Zamora — also shared out a larger networking analysis tool, which CLMOOC has used before, to show various interactions. The TAGs Explorer for NetNarr is here and open to check out. I am one of the open participants, but both Alan and Mia have university students in classroom experiences as part of NetNarr. All this analysis of our Twitter activities remind us the where we tweet, and when we tweet, and how we tweet, and hopefully leads to discussions or reflections on why we tweet. For me, it’s simple. I am a better teacher and a better writer, and a more thorough digital explorer, thanks to my connections and interactions on Twitter. Despite all of its messiness and despite the concerns over privacy and harassment, I still find Twitter to be one of the many places where my tribe hangs out on a regular basis, and shares, collaborates, makes, and reflects together. That remains a powerful draw. The other day, I wrote about my week of semi-digital hibernation, as part of a Digital Audit activity with CLMOOC. I mentioned that I weeded out a lot of folks from my Twitter stream. That got me thinking a bit more deeply: why do I follow those I follow? And what makes me unfollow them? Anyone who seems to have an affiliation with the National Writing Project. I am a sucker for friends and colleagues in the NWP network spaces, and have a NWP Twitter list going with nearly 800 people. Even though I clearly don’t “know” them all, I feel affinity for their work and ideas. A follow makes me feel connected to the larger network. If you write that you are a sixth grade teacher, I’m going to likely follow you. I may want to steal some of your ideas, or celebrate you and your students, or just glance over your shoulder. I am always looking to learn about teaching. If you are someone who dabbles in digital media, through the lens of learning and experimentation, I am likely to follow you, particularly if you are sharing out your creative process and interesting art. I like artists and teachers who push the boundaries, and are not afraid to write about success and failure, and the next project on the horizon. If I am in an open course, like NetNarr, I will likely follow other folks in that network. But I might unfollow you later. It depends on how strong the connection is that we make. Why might I unfollow someone? If you have nothing written in your bio on Twitter, I am probably going to stop following you (if I followed you in the first place). Using a few words to stake your claim to a space is important. Link me to a webpage or blog. That said, if the words don’t resonate with me? Probably unfollow. If you only retweet, and barely ever share your own writing or learning, or never engage in conversations or discussions, then I am unlikely to follow you. Life’s too short for too many silent interactions. But, I usually give some time for you to get acclimated to Twitter before making that decision. I know new folks have be immersed first. Most companies and organizations, even educational ones, don’t stand a chance with my follow button. But if they do, they best be clear about the work they are doing to advance student learning or digital writing, without a public on eye on “selling” their services. I know that goes against the grain of why companies are on Twitter. Too bad. Find another way. I’ll follow some bots, if they are interesting and creative. What I hate is when I follow a bot for a time, and then suddenly, that bot starts pushing inappropriate content out through “retweeting.” Unfollow. Block. There are probably more reasons why I stop following people. These are the ones that stood out as I continue my work on scaling down my Twitter followers and following streams. I am reminded of my CLMOOC friend, Algot, who has mostly shifted to writing in the Mastodon social networking space. There, just about every time someone follows Algot, he writes a personal and individualized note of thanks and welcome to that person, explaining his hope that he will be up to the task of engaging them in interesting thinking and conversations. How cool is that? Hey #NetNarr – What’s So Funny about Peace Love and Unicorn Playwrights? 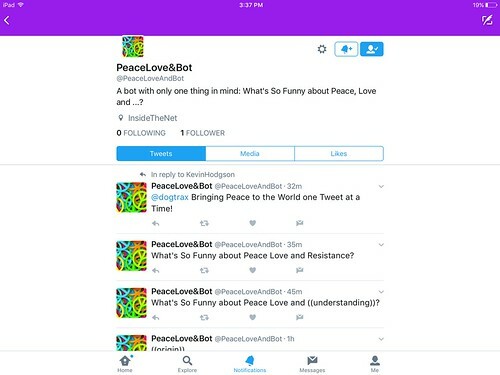 My PeaceLove Bot is set up rather simply: it tweets with the message What’s So Funny About Peace, Love and ______. The blank space is what gets filled by pulling from a database of terms. That’s where you can come in and help me. I want to expand the database of terms. 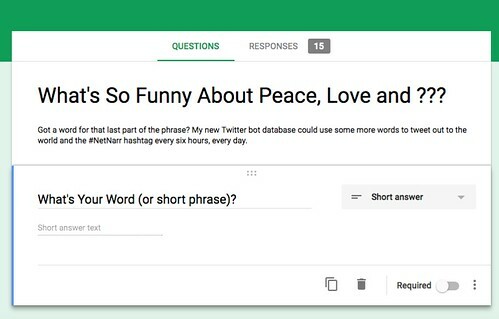 Use this Google Form to add a phrase that can be added to the Peace, Love & ______ phrase of the Twitter Bot, which now will be posting twice a day (instead of every six hours, as I had it set before). Hey #NetNarr – What’s So Funny about Peace Love and Transformation in Time? Thanks! The bot thanks you, too. If you are curious, you can view the database already in place. Some came from suggestions. Most came from my own head. Hey #NetNarr – What’s So Funny about Peace Love and Resistance Against Oppression? Yesterday, I wrote about diving into the world of Twitter Bots for Networked Narratives, and my interest in creating my own Twitter Bot, if only to understand the process of how it is done. Hey #NetNarr – What’s So Funny about Peace Love and Raindrops? Well, I did it. Check out the PeaceLove&Bot bot. Every six hours, the PeaceLove bot will send out a new tweet that begins with the lines made famous in the Elvis Costello song (but written by Nick Lowe) with random word replacing “Understanding” in the lyrics. I’ve included the #NetNarr hashtag in the code, too, so that the tweets get sent into the NetNarr twitter stream. Phew. It was both easier and more difficult than I thought, and it took a long time on Saturday to get all of the programming pieces together. I used a free program called Tracery and hosting site called Cheap Bots by the very generous @GalaxyKate and George Buckinham. Hey #NetNarr – What’s So Funny about Peace Love and Remix? The easy piece was that Kate and George really make the programming possibilities fairly simple to use. The difficult part was the ins and outs of making sure I was writing my code correctly, for any little thing made the bot go boink (hard to resist that alliteration and Scooby Doo onomatopoeia). First, I had to create an entire new Twitter account. 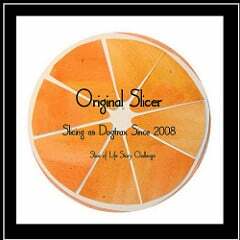 Which I did. But then when I connected the Cheap Bots to the account, Twitter got mad and shut down my account, asking me for a phone number to reinstate the account. I did that, and then realized that now my main Twitter account could not use the same mobile phone number as my bot account … ack … I confirmed that Cheap Bots could use my new Twitter bot account, and then reversed the use of the phone number (which I use as a validation tool for my Twitter account). Second, I had to figure out the coding of Tracery. I looked at Kate’s example, and how it worked, and followed a link to her tutorial (which was more complicated to me, a non-coder, than I wanted it to be). I tried to tinker with the program and kept failing. Hmmm. I Google searched Tracery and found an interactive site called Bother that allowed me to replace its code with my own, and generate a code that Tracery would use. Phew. I still spent a lot of time tinkering but it worked. You can look at and remix my code, too, if it helps. Third, I was stuck with the question. I am making a Twitter Bot, but what should it say to the world? I had Elvis Costello in my head, singing along with What’s So Funny (about Peace, Love and Understanding) and wondered if that might be a way to keep true to staying positive in this negative time of Trump, while also keeping the underlying mechanics of the Bot simple. It would use a common phrase but replace a word each time with a random word from a database. Fourth, what database? I realized that while ideally I would have my bot draw from some outside database, I could not take on the technical aspects of that. Tracery allows you to make your own database right in the code, so I did that, mulling over phrases and words that would remain positive and still fit in the song title. At one point (and I might return to this), I had this idea of using the invented, made-up words from my students’ Crazy Collaborative Dictionary (which I wrote about the other day) as the database for the bot. But when I experimented, the bot didn’t seem to want to recognize the invented words. It may have been something that I did wrong with the code. Not sure. So I went back to my original database. What’s So Funny about Peace Love and Resistance? And now? The PeaceLove&Bot is loose upon the world. 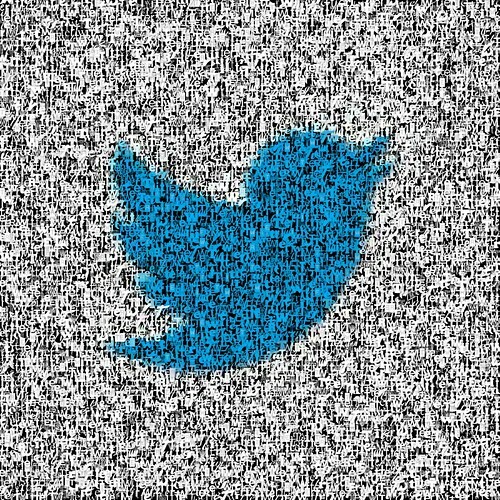 Every six hours, a new tweet is sent out. I may yet add more words to the database, and heck … I invite you: What words or phrases should end the What’s So Funny about Peace Love and ?????? Leave a comment here at the blog. I’ll add your word in.